Summer is just around the corner. I love this time of year when the days get longer and the sun is shining brighter. It’s time to break out the BBQ grills and have a backyard party! What can be more fun than throwing a summer party? Why, throwing a themed summer party, of course! 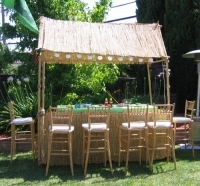 One of the hottest themes for spring/summer parties is a Hawaiian Luau Party. We’ve gathered some ideas from past events to help you plan the perfect luau party. We can start with the type of event you want to have. If you want a formal sit-down dinner, you can rent 60” round tables that sit 8-10 people or 72” round tables that sit 10-12 people. Having long rectangular banquet tables is also a great way to have a sit-down luau as well. For a more casual gathering, you can rent 48” round tables that seat 6-8 guests and add some stand-up cocktails so that people can mingle and move around throughout the party. Luaus usually have lots of vibrant colors such as turquoise, lime green, bright yellow, fuchsia, and orange. You can incorporate some or all of these colors throughout your event. We also have a Hawaiian print linen for rent that would also be great for a Hawaiian-themed event. Please check out the rest of our blog, along with pictures of the Hawaiian Luau party that we put on.